Lots of traffic, high CTRs, more ad clicks, and more income…..
To achieve this, there is a KEY; without which you can’t accomplish anything. Yeah….Content Creation – You guessed it right! Do you have a blog or a business website? If yes! Content is everything you can ask for and should be asking for. Informative rich content helps shape your company’s reputation and online presence. Never hired a freelance content writer yet? Thinking to get the one but don’t know where to get started? 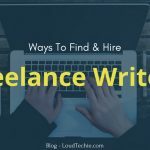 Keep on reading this article to find the best ways to hire a quality freelance writer…. As my personal experience in this internet world, content is my evergreen requirement. I keep on searching and approaching more talented freelance content writers to be in my content writing team. Let me ask you one question. Where do you search for your content writing needs?